www.lanzbulldog.de - Forum • Thema anzeigen - A big journey! I need to take my D8506 on a 37 mile / 60km journey. Is this a reasonable distance to be able to travel? are there any things i need to do before I go? Also do I need to stop and oil or check anything part way through the journey. I have the standard gear set (22/kmh). engine john hat geschrieben: I need to take my D8506 on a 37 mile / 60km journey. Is this a reasonable distance to be able to travel? are there any things i need to do before I go? Also do I need to stop and oil or check anything part way through the journey. I have the standard gear set (22/kmh). Thanks, I just thought I would check. It thought it was unlikely that I would need to stop as it wouldn't make for practical running in a work environment if you had to stop every 30 minutes. I used to have a canal boat with a hot bulb Petter in it and I used to run that for 14 hours non stop some days. An occasional check and splash of oil on the eccentrics was all that it needed. It would soon tell you if it needed attention by a change in exhaust note or colour of the exhaust. I am rather looking forward to it. I am setting off nice and early to avoid traffic. It is going to a friends house to go in his workshop so we can fit new rear brakes to it. I don't have the space to pull the wheels off and work around it. I don't think it should be too bad. I am allowing 4-5 hours for the drive. The brakes should be pretty easy I hope. As they are 8506 pattern brakes they should go on pretty easily. I think looking at the manual that I don't even need to remove the half shaft. I just need to remove the wheel and the backing flange and fit the drums in place with the linkage all built up. Always looks easier than in reality. I am sure I will have to leave it at my friends for a while until it is finished. Mine is an ex-Aussie bulldog. Hence the lack of brakes. The journey back will certainly be easier with the brakes! I amafraid you will be in for a surprise fitting the brakes. Trouble is that the backing plates will not fit over the axle flange. Thus you will have to remove the half axle with the bearing housing flange. Then you need to undo the big locknuts on the half axle and press the flange off the axle. You can then move the backing plate over the axle and put the rest back together. Be careful when pressing the flanges off the axles. They can be very tight and the flanges are cast, thus brake easily. Make sure you have good and even support. And I do think you will need a decent press to do the job. You can´t heat anything either to make the job easier. another advise I forgot to mention. Remove the five axle nuts before you take the wheel off. That way you have a solid grip while the hole thing ist still held by the tractor. Then use a hydraulic cylinder to press the steel disc off the axle by putting the cylinder between the disk and the gear housing and move it about. Easier it is to pull the axle out with the disc still on. Put it on the ground and knock the disk off with a sledge hammer. It does take a fair bit of hitting so don´t be timid and don´t hit the cast flange. I'll give you a call about this if thats ok. All the advice is welcome. The reason I am going to my friends is he has presses and the like so we should be ok. I have little space and only basic tools. 60k on the road and an easier job is well worth while. My Bulldog was faster thn I thought. It took 3.25 hours to travel just over 60km. No problems at all on the way. I don't think it hardly got warm. I am really pleased that ti went so well. Once I have fitted the brakes I will feel a lot happier and who knows maybe an England to Germany run might happen one day! I do need to get a better seat though. Mine isn't original and has no back. I could hardly walk when I finished the journey so a cushion is a must for a longer trip. All I have done so far is remove the rear wheels. So progress is slow. Next job is to pull out the half shafts and press off the old wheel centres and small axle flange. I need to replace a seal on one axle and the bearings I think. I may do both whils I am in position to do it. I think assembling the brakes will be easy once I have done this. I just need to find the time. Hello, lovely story so far, how's it going now, everything pressed out and in again with new brakes etc? 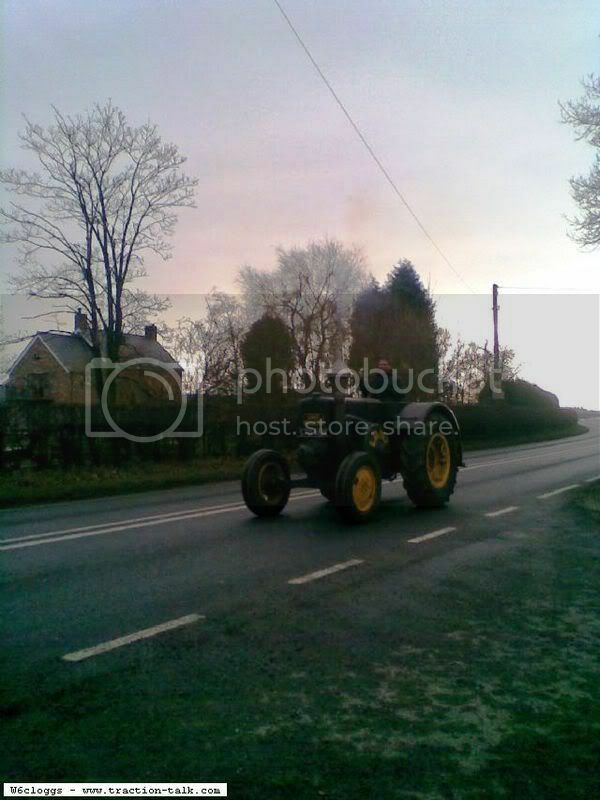 Did you ever get any photos when you were on the road with the tractor? My Lanz is now back home. The brakes are fitted. At the same time we replaced the half shaft bearings and seals. The brakes are very difficult to fit but were made worse because the kit I purchased needed a lot of machining to make them fit. I also fitted a new exhaust and have just fitted a super jet supplied by Theo Scheres. The journey back was good except that it was -6c. I want to get some Lanz wheels now as the rear are KL and the front we think are old lorry wheels made to fit. I will try and post some pictures below. Sunday testing the new jet! The journey home 3 weeks ago. 60km in -6c! I wish I had the new jet fitted. The back wheels do not shock the eye too much, but as you say the fronts have been bodged to fit, everyone must keep their eyes open to find a pair for you! 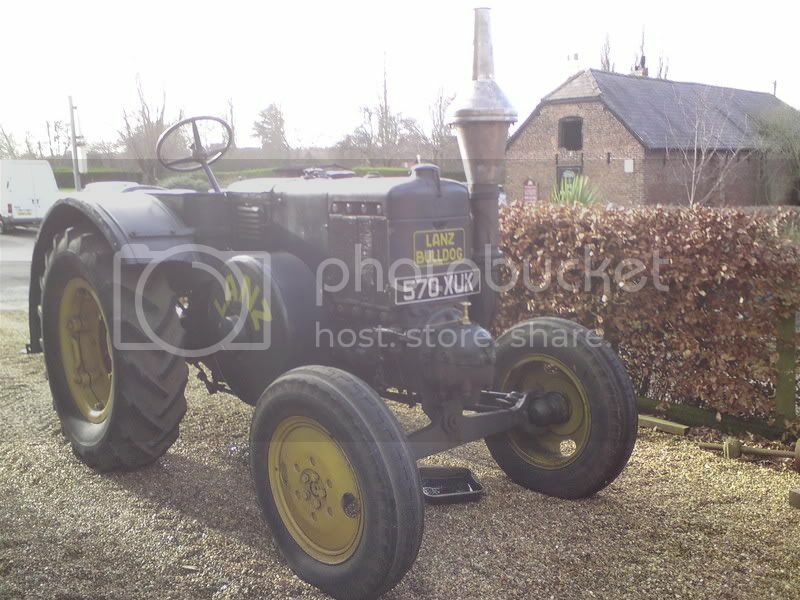 We have the little sister the french equivalent to a 7506 called "Le Percheron" which is a super tractor. Unfortunately we do not yet have a "Carte Grise" (registration document) so we should not take it on the road, it has sometimes just crept out in the village and surrounds and is a wonderful machine to drive, I can only assume that the big one is even better with it's 10litre dustbin. Was the original "injector" defective, I must say that I have considered replacing on the Percheron, but never quite got around to it what with all the other bits and pieces to do! I have the brakes to do on it also, I hope that I do not have the problems that you have encountered, perhaps later this spring I will find out!